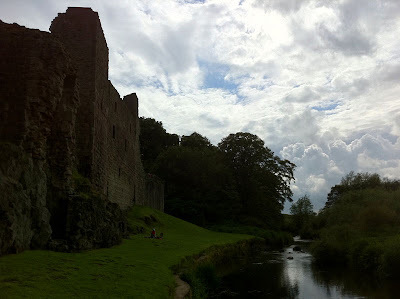 The main thing about Hailes Castle is the fact that I had never heard of it before. Out on a bike ride on quiet roads in East Lothian, we came across this intriguing ruin. What was it? Hailes Castle, on the banks of the River Tyne, just east of Haddington. We took a look round. Never mind that it dates from the 13th century and has featured strongly in the story of Scotland's medieval invasions by England. I'd never even heard of it! Its original owners, the de Gourlay's, supported the Plantagenets in the Scottish Wars of Independence. Hailes will thus have welcomed a couple of English armies in its time. 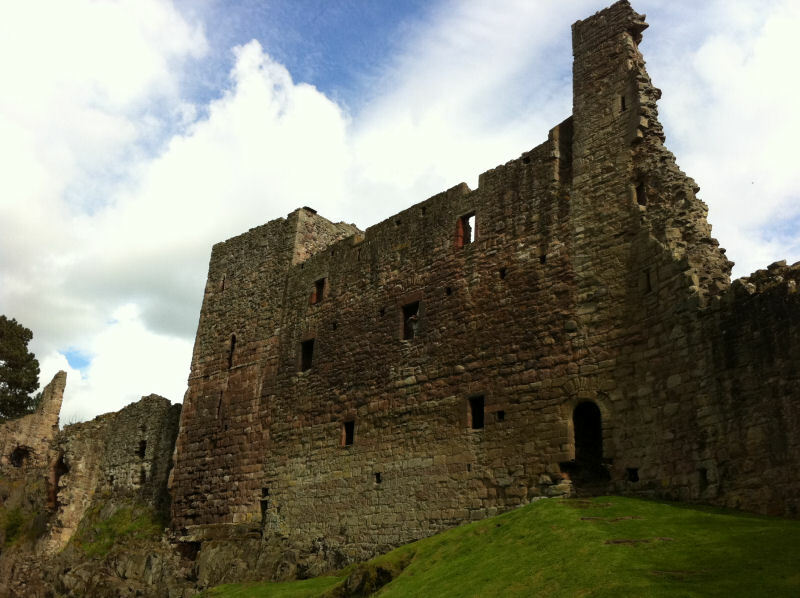 After Bannockburn, the de Gourlays were ejected and Hailes was given to the de Hepburn (not Dee Hepburn) family. Hailes sits on the main invasion route into Scotland for any army coming from the port of Dunbar rather than over the hills via Lauderdale. Doubtless Edward III came this way on the occasion of the Burnt Candlemas in 1356, when the English were forced to withdraw before reaching Edinburgh as a great wind blew up destroying their supply fleet - divine retribution, the Scots believed, for the desecration of the chapel of the Virgin at Whitekirk and the destruction of the Franciscan Friary in Haddington, known as the 'Lamp of Lothian'. Now all is peacefully ruined in carefully mown lawns with a small burn at one side, locals fishing by the trees overhanging the river on the other, the main route to Edinburgh bypassed by the noisy A1 dual carriageway - from which, if you are looking out the window at the right moment and the right angle, a glimpse of Hailes can be had. I know that East Lothian is over-endowed with castles, but this is still a pretty substantial and historical ruin to never even be aware of its existence. Have you ever heard of Hailes Castle either? Touch rugby is a fast-growing minority sport, and is my favourite team game. It is minimal contact, requires minimal equipment, and can be played by both sexes, even in mixed teams. It is very sociable. Imagine normal rugby with the pack and tackles removed, leading to a faster-paced game, based more on skill than brute strength. For a glasses wearer like me, unable to head a football or get involved in a rugby tackle, it is ideal. Any week in summer you will see people in the likes of the Meadows or Inverleith Park in Edinburgh playing the game. And the World Cup is currently being played right here in Edinburgh, right now! Last night I went along to Peffermill to watch some games. It's free to go and you can wander around the site at will, watching whatever game takes your fancy. It is great to see top players in your favourite sport strutting their stuff. A couple of the teams from countries with no hinterland of playing touch were not significantly superior to those you would see in the Edinburgh leagues of a weekday evening - one of the joys of playing a minority sport is seeing that the lower levels of the international scene are not that far outwith your own grasp. But other teams at the top level were breathtaking in their skill, especially the Australian women, who play at an entirely different level to any of their competitors, or the French mixed team, who play with an entertainingly direct, attacking flair. Perhaps I will see you at the final on Sunday! Having seen ospreys near Kirkcudbright and dolphins in the Moray Firth recently, we fancied trying our luck at seeing an elusive recent reintroduction, beavers. Once native to Scotland, they were hunted to extinction centuries ago. But now they are back! A few families of Telemark beaver were introduced to Knapdale a few years ago, and they have started to breed. North Knapdale is ideal country for them - knarly, heavily wooded ground laced with streams and small lochs. It's part of a plan to increase the biodiversity of Scotland back to something like where it was in years gone by. Sea eagles have been succesfully reintroduced, although wolves would be a step too far for most. Wandering around, we saw plenty of evidence of beavers - park at Barnluasgan and follow the trail - but not any beavers themselves. Turns out they are nocturnal creatures and the only chance of seeing them is at dawn or dusk. We would have to return another time. By coincidence the BBC's Springwatch team was filming in Argyll just after we left, so if you want to see more of them now from the comfort of your own home on BBC iPlayer, click on the link above and view the first four programmes in ther series. 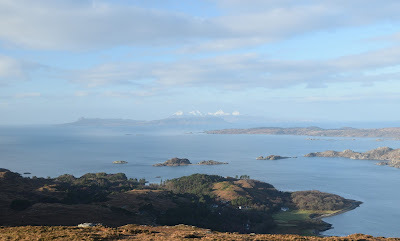 While in the area we fancied a longer walk, so took a trail from Crinan Harbour up to the fault line at the north end of the Taynish peninsula. This goes to a prehistoric fortification called Castle Dounie. There's little to see now at Castle Dounie save a tumbled-down wall, but it is spectacularly sited, and commands a wide view up and down the Sound of Jura - anyone who wanted to control this coast would have had a lookout post stationed at Castle Dounie. Back down we took a look at Crinan Basin, with its dinky 20ft lighthouse and tranquil waters... tranquil until the heavens suddenly burst open, and we ran back to the car as fast as we could, soaked to the skin and laughing hysterically. It had been a muggy, windy day, with alternate sun and rain - but now it was on for good and we headed home happy, stopping to admire a bank of bluebells on the road home. These run all the way up the road from Lochgilphead to the head of Loch Fyne. Bluebells thrive in the 'temperate rain forest' of Argyll - I predict a similar success for the beavers! And so to the big event I have been training for for a while - 70 Wild Miles. This was my recovery target after damaging my knee a year ago. But 70 Wild Miles is not a normal triathlon - the 47 mile bike ride from White Corries to Taynuilt, the 10 mile canoe up Loch Etive, and the 13 mile run back up Glen Etive towards White Corries is for charity - CLIC Sargent, the children's cancer charity. I asked one of the volunteers why she was doing it - and was regaled with a woeful tale of suffering. I asked another, to similar effect. Whilst it was a hard shift doing the race, it would be a lot harder having a kid with cancer. I'm closing our page at the weekend and informing CLIC Sargent so they can collect. It would be great to get to £600, we're only £50 short, so if you feel like making a donation do so - every little helps! That's the page sent off to CLIC Sargent to collect - a grand total of £795 raised. Thank you ever so much to everyone who contributed! Linlithgow is one of the nicest towns in Scotland - a rose in the dungheap for some, located as it is in West Lothian, home of the shale bing and departed industry. 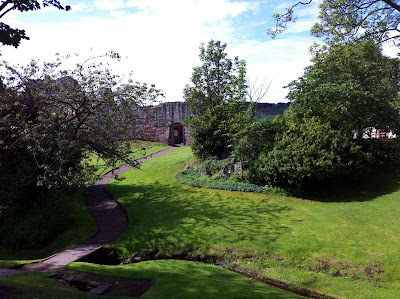 Linlithgow however has the history as one of the first four royal burghs, the location by Linlithgow Loch and the canal, the real ale pubs and the leafy avenues that other towns in West Lothian lack. If you meet someone middle-class from West Lothian, the odds are they live in Linlithgow. It's the Kilmacolm of the east. But I don't want to spend this post slagging off West Lothian, or trying to make people from Linlithgow sound like they think they are made of chocolate. Let's concentrate on Linlithow itself. For a Central Belt day trip it is hard to beat. First of all are the surroundings. Immediately south of Linlithgow are the low Bathgate Hills, home of Beecraigs Country Park where you can see all kinds of wildlife and go on a badger watch. Rising out of the park is the abrupt wee crag of Cockleroy with great views over West Lothian. OK, I know. They are views of West Lothian... but Linlithgow is well seen too from here. Up here we enjoyed vigorous buffets of wind and whipping, saturating rain showers, glad of our waterproofs, the cows and sheep in surrounding fields sitting down and the trees waving like a nutter desperately trying to attract a friend across the road who is trying to avoid them. Further up at the top of the Bathgate Hills we visited the viewpoint near Cairnpapple, a prehistoric burial cairn with a panoramic view over the surrounding countryside. From up here it is clear that West Lothian is in fact rather leafy, a pleasant if not dramatic landscape. Let's roll downhill to Linlithgow and get out the wind! I'd always wanted to visit the palace, and was excited at the prospect. First you pass by St Michael's Kirk, built for the use of the palace occupants. It retains a thriving congregation to this day and a concert was in progress when we approached. We wandered around the outside. Ornate niches for Catholic idols were empty, and there was evidence of damage from the occupation of Cromwell. However the spire is the most notable sight in the whole town, a gleaming aluminium structure erected in 1964 and replacing the old stone crown that was removed in the 19th century before it fell down. Finally we passed the church, and walked under the entrance portal to the palace, gaudy with freshly-painted shields. The palace was founded on the site of a previous castle, and built and rebuilt in various phases between 1420 and 1620, with late medieval, Tudor-style, rennaisance, and Jacobean facades. The very first thing that struck me was the similarity - if you stripped back all decoration - to the French chateaux of the Loire. I would love to see this building with its harling, windows, tapestries, roofs, ornate ceilings, and gaudy gilded statues still intact. 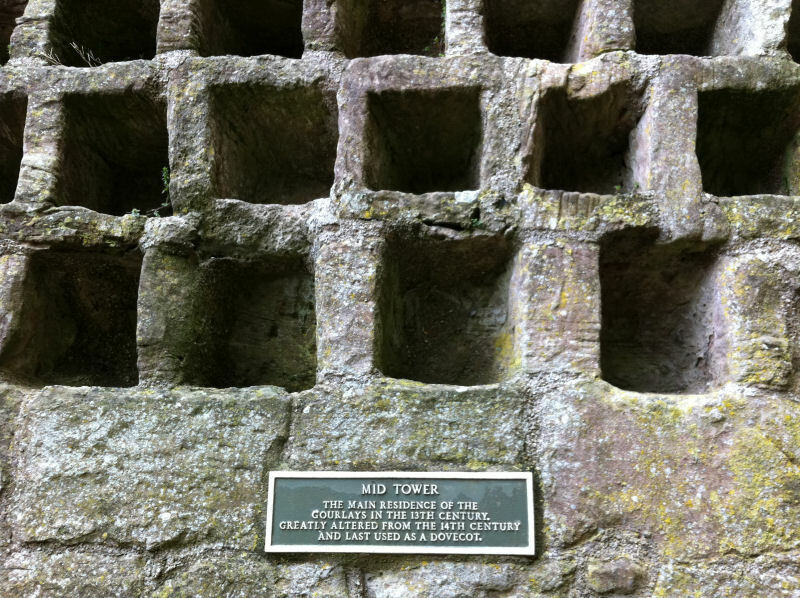 Too often in Scotland all we are left with is ruins thanks to our tumultuous history. It makes me angry sometimes! "What's that up there?" I asked the guide. "We think it might be the only pre-Reformation niche idol remaining in Scotland," she replied. It's a mouldering piece of sandstone now: wonder how it survived the destruction of idols in the Reformation? Let's have a wander round the palace! The palace is bigger than it looks: we had two and a half hours to look around and thought that would be plenty. But there are so many wee details to see that before we knew it the staff had come out with a megaphone to close up. We still hadn't seen everything! Oh well, back on the free day next spring. We finished the visit with a stroll round the loch, the wind buffeting ducks and swans nesting awkwardly close to the path. Linlithgow Palace - we'll be back. Perhaps on the next jousting day?